More and more homes are connected to the internet and PLDTHOME has remained the preferred broadband provider in the Philippines. PLDT HOME registered a double-digit growth in digital services such as the PLDT HOME Telpad, the all-in-one tablet, landline and broadband, the triple-play service where broadband and landline services are bundled with Cignal digital TV, as well as the home monitoring system FamCam. PLDT HOME recorded a commanding a market share of over 70% at the end of the third quarter of 2015 making PLDT an undeniable leader on this field. PLDT, for example, registered three times more new subscribers compared to its nearest competitor. “PLDT HOME’s fixed broadband has continuously reinforced its industry leadership with its significant array of new digital services and compelling content, providing entertainment to customers everywhere, whether they are at home or away from home. Beyond telecommunications, we are delivering entertainment, peace of mind, and urban comfort to our subscribers,” he said. PLDT HOME also announced its roster of content bundled with broadband subscription from South East Asia’s number one video-on-demand provider iflix and the region’s leading broadcaster Fox International Channels to live HD channels from Cignal. These services exacerbated the growth of broadband subscription supported by a strong and aggressive activations program. PLDT HOME has also launched the first and only Quadplay, the innovative bundling offer where mobile services are packaged with voice, data, and cable television, providing customers with connectivity everywhere. It is the mobile service that contains PLDT HOME DSL broadband, PLDT landline, Cignal Digital TV and Smart mobile. 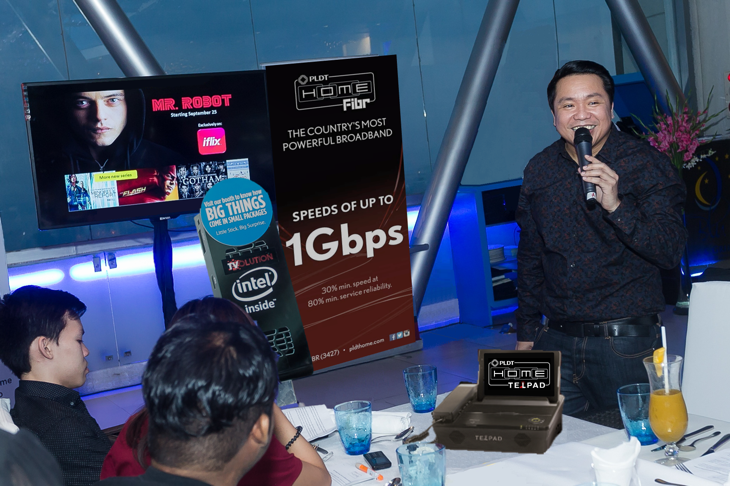 “Following a strong Q3 performance, PLDT HOME introduced the TVolution stick—a device that turns any HDMI-capable TV to a fully functional Windows computer, and more recently, PLDT HOME Fibr rolled out speed boosts for all subscribers and broke new ground with the unveiling of the country’s first 1 Gbps broadband connection, further enriching PLDT’s product portfolio for a digitally connected home,” Dujali said. The PLDT Group’s robust and resilient fixed and wireless networks, with its most extensive fiber optic footprint that spans over 100,000 kilometers, enables it to offer reliable broadband services that can simultaneously deliver voice, video, and data at faster speeds and larger capacities through various devices – from computers, tablet, and cellphones, to television sets.